Ever wonder how airline jets navigate the Earth from 30,000 feet on a cloudy day? The road maps provided by Google Maps wouldn’t be that relevant after all. The fact is most flights use radio navigation or GPS to find their way, and the radio navigation beacons they use are often visible in Google’s aerial and satellite imagery. There are many types of radio beacons that are still in use today, but the majority are called VHF omnidirectional radio range or VORs. There are VOR stations all around the world, and given how widespread they are, you may well have passed one by without realising. 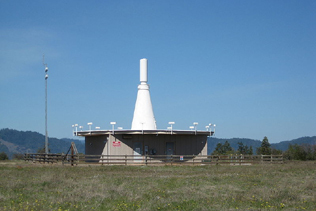 The most common shape of the ground station resembles something of a bowling pin on a circular building. Pilots use the signal which is broadcast from these towers to fly to and from stations, therefore navigating across the sky. Most beacons are located either at the airport, or placed out in far-away regions to avoid any interference on the signal. Some examples of these remote beacons include the Mitbee VOR in Oklahoma and the McComb VOR in Mississippi. Take a look at the Babylon NDB (Non-directional beacon) on Long Island near New York. This beacon is situated right in the middle of a densely packed neighbourhood, and since it is only used as a directional beacon and not an omnidirectional range, it doesn’t have the classic bowling pin shape like the VORs. Due to the congestion around this beacon the FAA has declared its signal unusable beyond 15 nautical miles, which isn’t very far at all from a pilot’s point of view. It’s not unusual to find beacons in very remote and rugged areas of the west of the US as well. Remember, some of the aeroplanes flying over these sparsely populated areas still need beacons to navigate, and thanks to this we see some interesting locations for these VORs. Out in the barren desert we can find beacons like the Sod House VOR in Nevada and the Peach Springs VOR in Arizona. If you start looking deep in the mountains however, beacons like the Salmon VOR in Idaho and the Red Table VOR in Colorado (which is almost completely buried under the snow!) can be found. Notice how the Red Table VOR is painted in dark colours to contrast with the snow. Pilots use these different types of beacons to navigate across the sky when they can’t see the ground. For example, let’s say we were going to pilot an aeroplane from Fort Lauderdale, Florida to Orlando, Florida. If we chose to use radio beacons for navigation, we could depart to the north using Fort Lauderdale’s own VOR as an initial direction (flying away from it), then switch over and fly towards the Palm Beach VOR as our initial waypoint. After we cross over the Palm Beach VOR, a slight turn to the west and radio beacon frequency change would allow us to lock onto the Vero Beach VOR, then another shallow west turn and switch would take us directly to the Orlando VOR. During this entire flight, we would not need to see the ground at all (until we land anyway) just as long as we have functioning navigation equipment in the cockpit. Aviation beacons are all around us, but the reality is that radio navigation is quickly becoming a thing of the past. With technological advances like GPS navigation, existing radio beacons are more commonly being used as a waypoints rather than actual navigation aids. For more information on aircraft instrument navigation, be sure to check out Wikipedia. If you would like to try and fly to a VOR yourself, try this free web based simulator. Thanks to Runway Finder for helping me locate some of the above beacons. That’s the Pendleton VOR! It looks like it shows up on just about every chart of the area as a very important beacon navigating planes around Boardman’s restricted airspace. Also, after some poking around, I see it’s also the first reporting point for just about any plane arriving into either Portland or Seattle from the southeast. So it look like it gets lots of traffic! You should look up from there sometime… I bet you’ll see planes! Thanks for this post – as a pilot myself I am always looking up radio aids that I use in google earth, and during my instrument rating training (cloud flying) took a few road trips to find them; sort of like an easter egg hunt for aviation geeks! Another bit of trivia – the older style NDBs are essentially AM radio stations, so the receivers can pick up the ball game on long cross country flights. Seriously, these things can be a bugger to find! It’s like looking for Waldo! Given simple info like 6.5 miles off the end of a certain runway, you would think it would be easy to spot them. However, it’s not hard to end up looking for 15 minutes for one little beacon. ha! Chris, this wouldn’t be so funny if i didn’t know exactly what you’re talking about. still trying to find HAGET, the LOM for runway 5 at KLWM. The LOM, HULLZ for 33L at Logan is at the end of a penninsula next to a giant windmill and elementary school. The ferry into Boston also picks up from here. Haha! This could be a fun little game. Is this it? Next to Hagget Pond? I have read this post and if I could I desire to suggest you some interesting things or advice. Perhaps you can write next articles referring to this article. I wish to read more things about it!